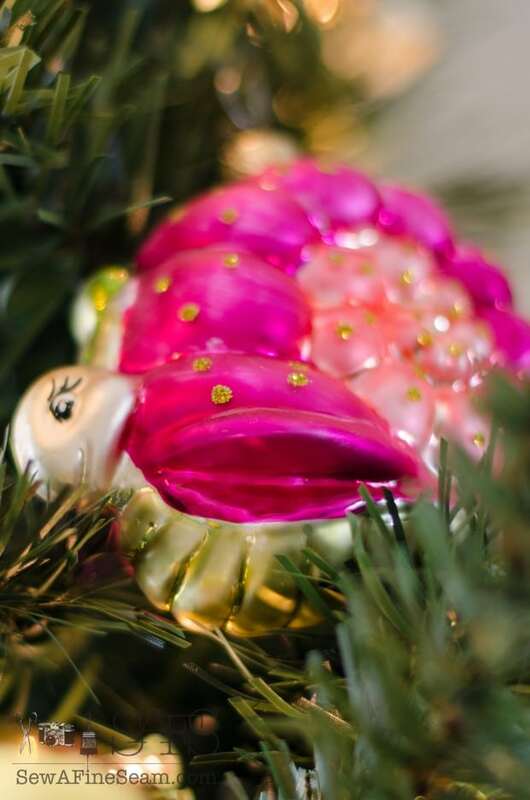 I thought I’d share a few close-ups of my ornaments. Most are vintage ornaments I’ve picked up at goodwill and garage sale. And several are blown glass ornaments that I’ve collected over several years. Past the tree you can see the woven bag from Haiti filled with bay and boxwood. 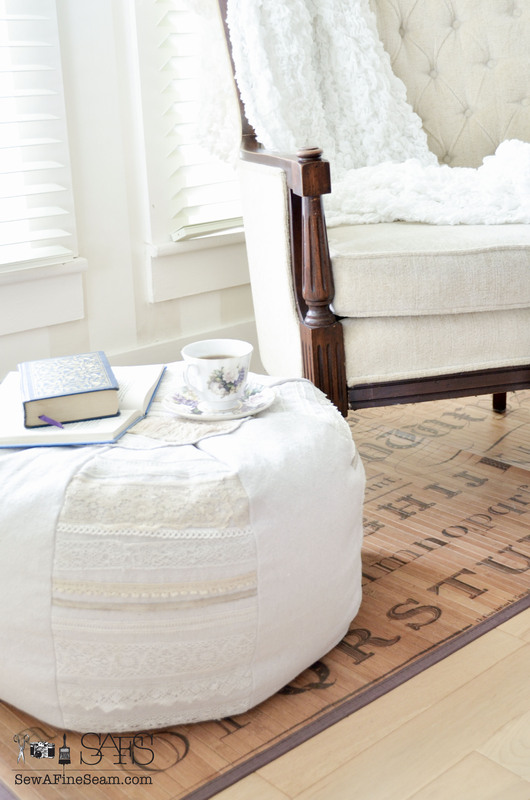 It hangs on a vintage window beside the chair I sit in to have my quiet time, read my Bible, and write my blog posts. I’ll share a couple more photos of that space in another post. 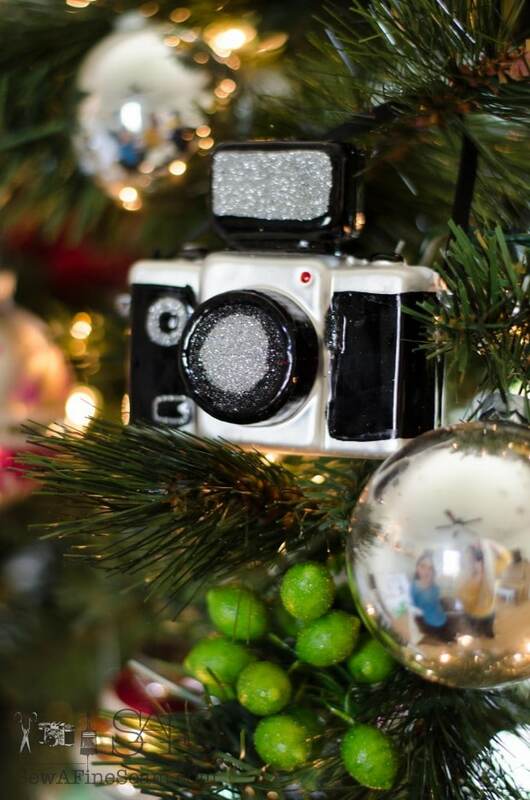 I just love the glitz and glitter of the ornaments on a tree. 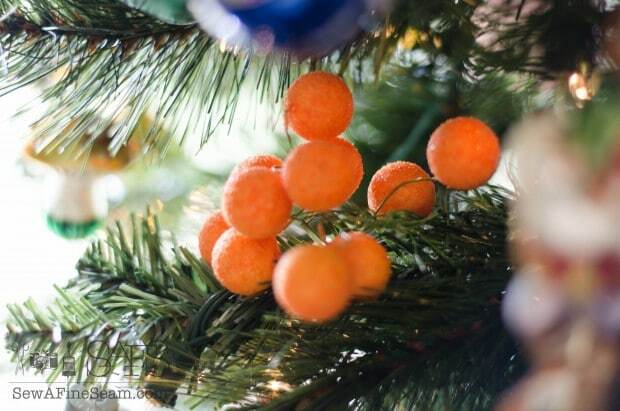 I have several pieces of faux fruit and this year I tucked them all into the tree. 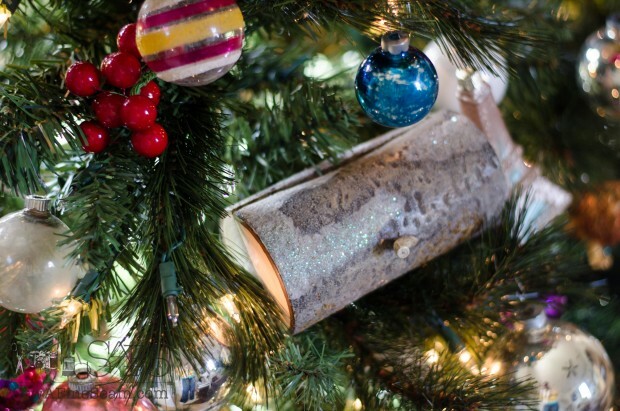 I also have two birchwood log boxes and I decided to tuck them into the tree this year too. I love the snail! One of the first blown glass ornaments and given to me by my Mom for Christmas years ago. 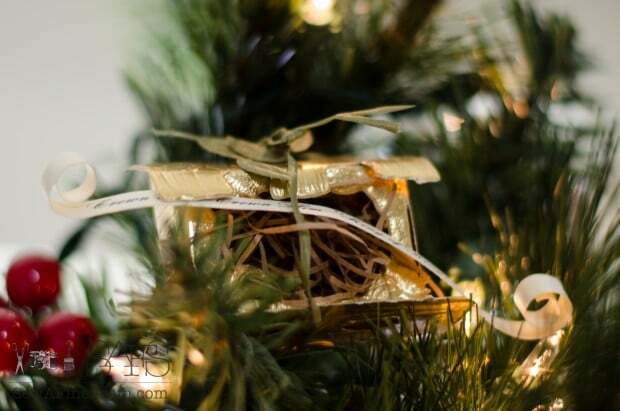 Gold Foil Paper Creche tucked into the top of the tree. 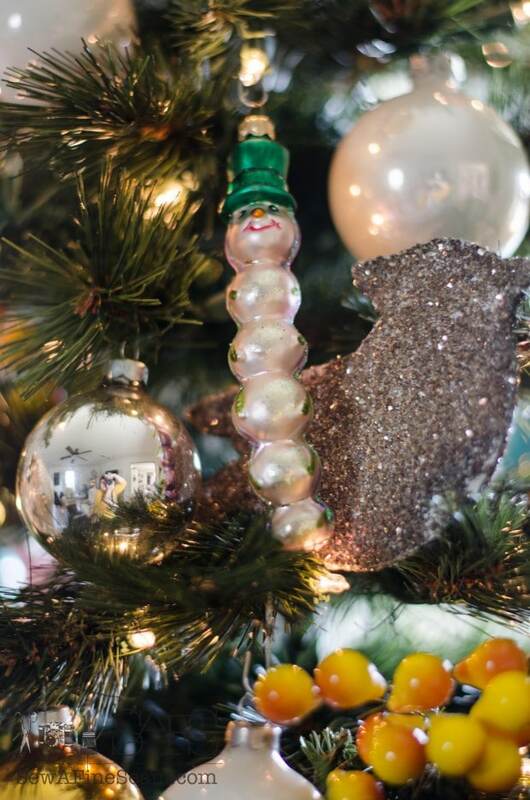 This inchworm was my very first blown glass ornament. I bought this one myself and put the rest on my Christmas list the first year I started collection them. This is one of my newer blown glass ornaments. My sister gave it to me a couple years ago. Another one my sis gave me. My second drummer boy. 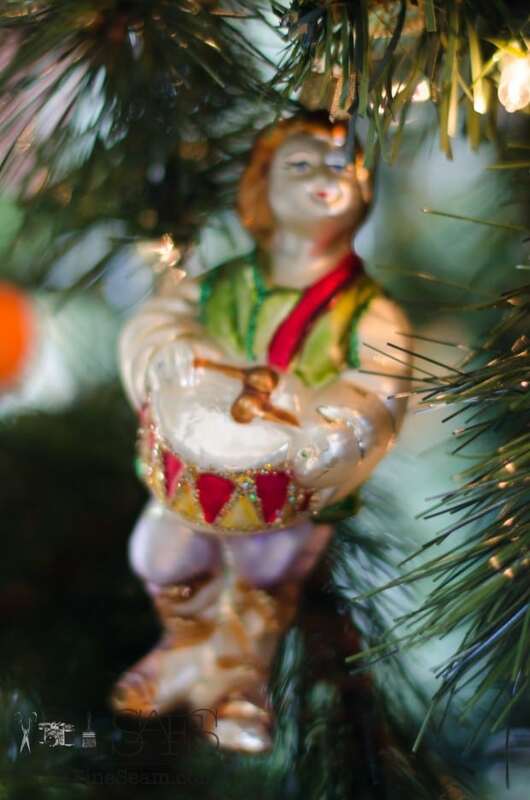 I love the drummer boy even though I seriously doubt there really was a drummer boy at Jesus’ birth! It’s a cool tale and I love the song. 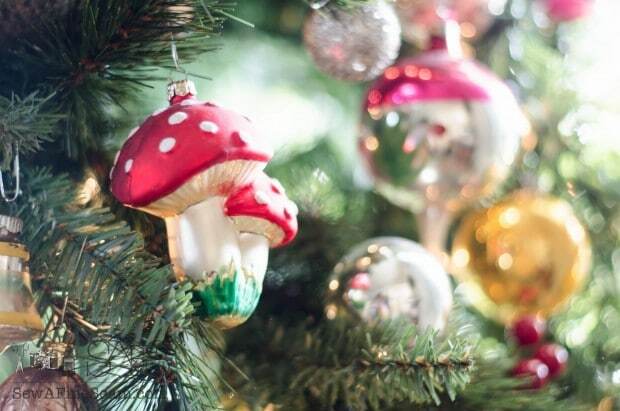 Mushroom blown glass ornaments. I have several of these in different sizes and a couple colors. They were among the first of my collection too. Yule log. My sis gave me this one too! This camera I found at Target last year! LOVE it! These birds I found at a garage sale last summer. I thought they went well with my others. The Eiffel tower my Mom gave me and I think it came from Kohls. I really like the tree in front of the window. I love driving by houses that have lit trees in their windows at Christmas time and now people can drive by mine and see a lighted Christmas tree! 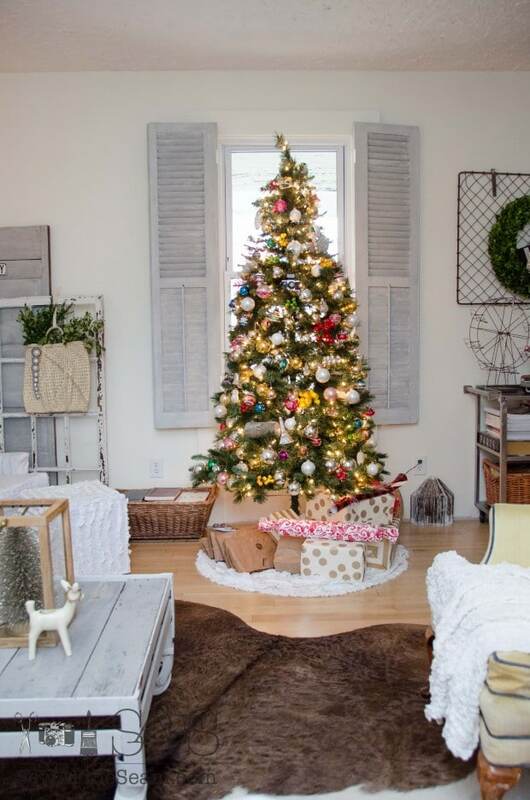 I also love being able to look into the living room from my dining room or kitchen or workroom and see the tree. Camera on a tripod and the shutter slowed way down will give you the brightness without the blur! And I couldn’t help taking a pic out-of-focus. 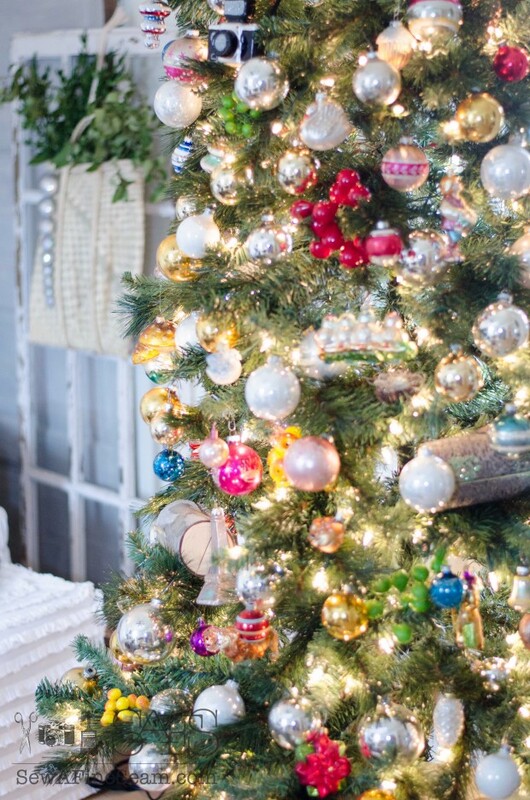 I love the sparkle of the lights and ornaments in this shot. My living room feels warm, cozy, and welcoming. Come on over and I’ll fix you some coffee or tea and we’ll have a chat! Your tree looks lovely! 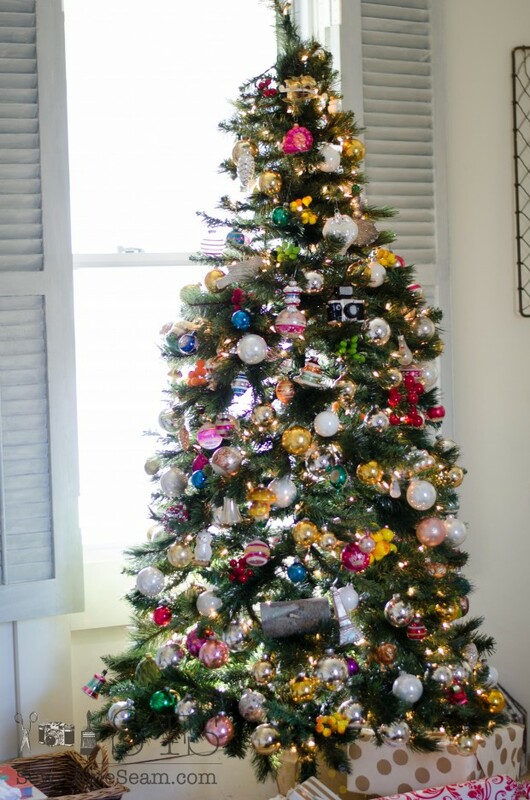 We collect vintage ball ornaments too, but I didn’t have the energy to put them all on the tree this year. Love your whole room! Thanks Alison! 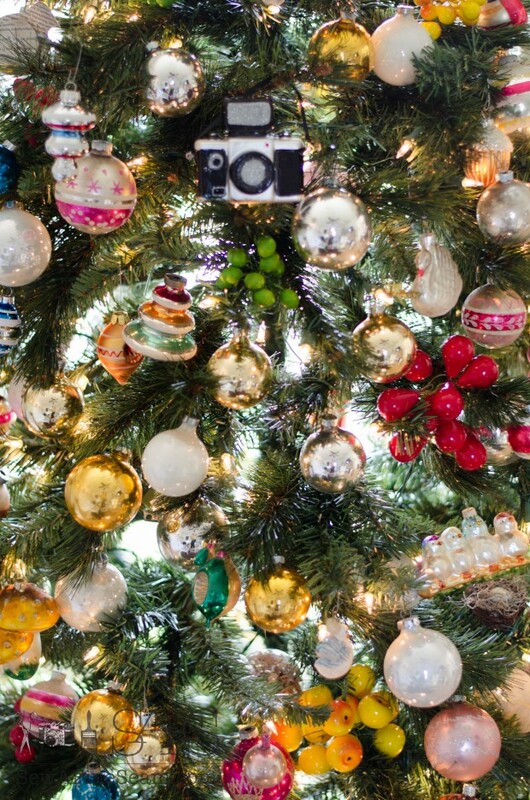 It does take a long time to get all the ornaments on – I didn’t even put all of them on. I was going to pack it even fuller but I ran out of steam and never got back to it. 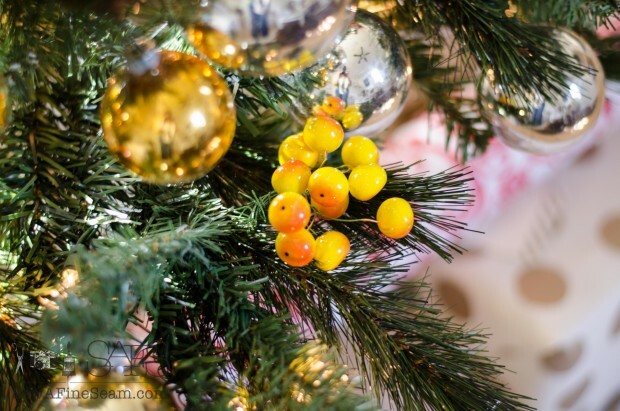 Your tree and ornaments are beautiful!! 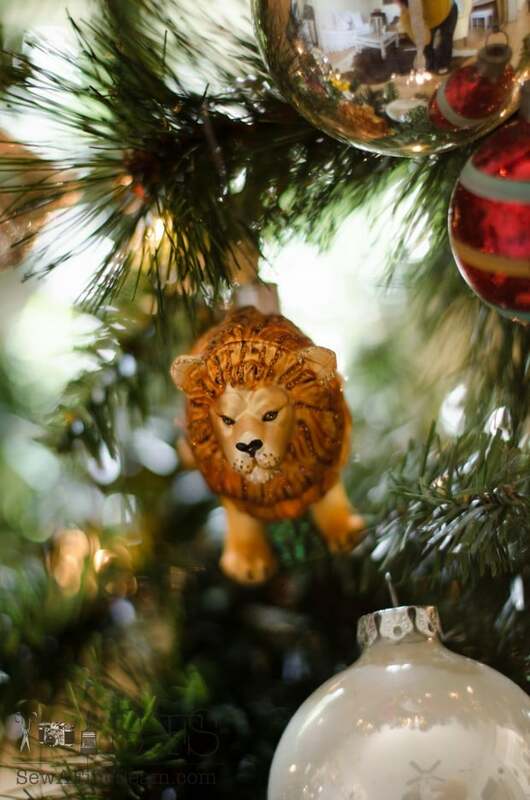 I love unique ornaments on a tree. 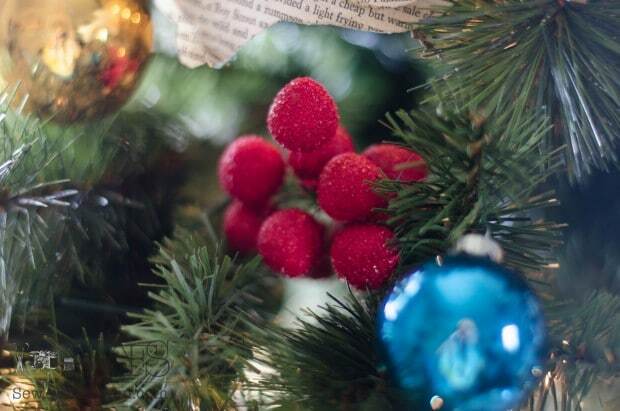 My tree has all homemade or looks-like-homemade ornaments – only one ball that looks like it hand painted. 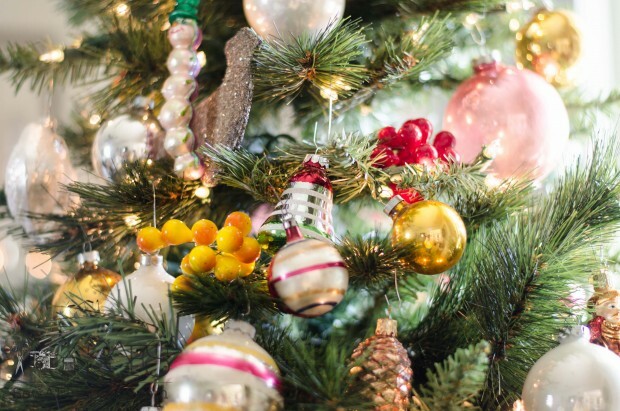 As much as I love the smell of a real tree – and the fun of going to the mountains to cut my own – an artificial tree is so much easier and in many ways it is safer. I like my Wal~Mart tree just fine!! 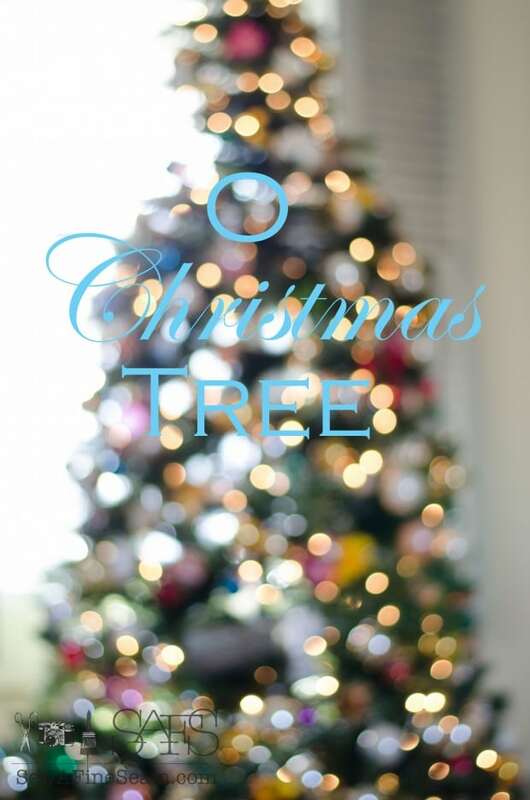 Thanks for sharing the beauty of your tree. Fake trees are much easier than real! We had a real one once but it was a terrible mess getting it back out of the house when it was all dried and crunchy! I’m happy with my Wal-Mart tree for now! 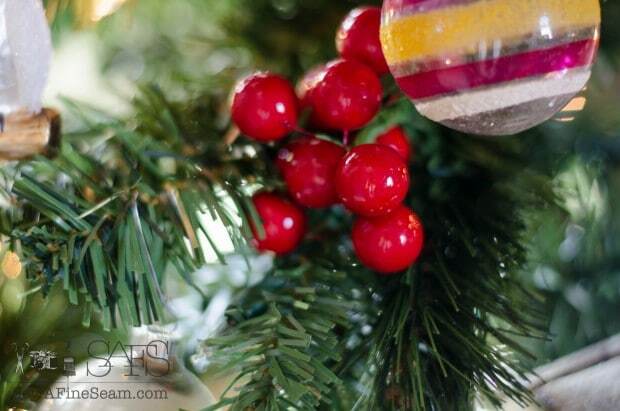 Love your blown glass ornament collection! 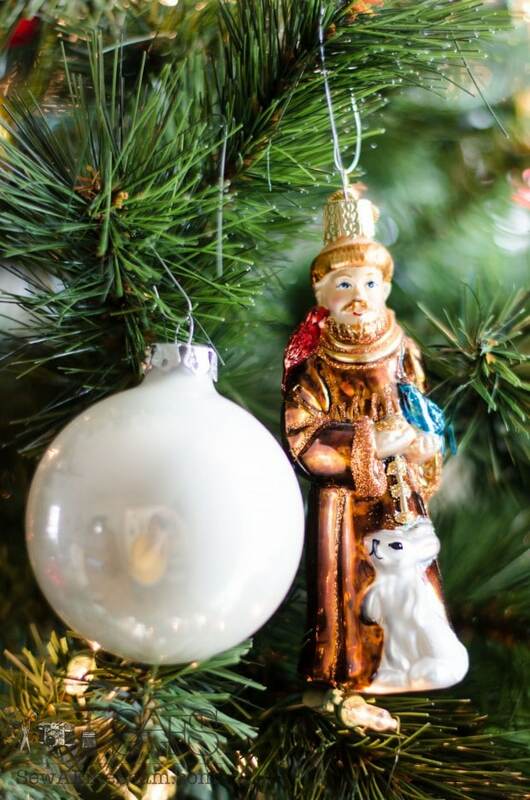 When each of my three children were born I bought a Precious Moments Baby’s First Christmas ornament and then have added a new special ornament for each of them every year. Their name and the year is written on the bottom of their ornament. They are now in their late twenties and starting their own families. I’m now starting the tradition with my grandchildren. 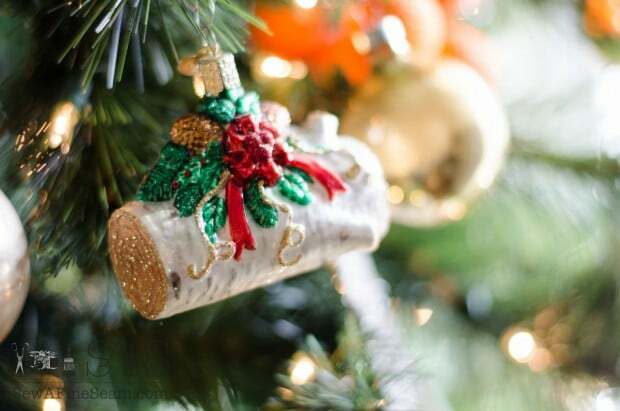 When the family comes over every Christmas the first thing they do is to find their new ornament which is usually placed front and center on the tree. When I pass away, their ornaments will go them and I hope they cherish them as much as I do. Family traditions are so cool Diana, your kids and grandkids are very blessed to have you creating memories they will always cherish! Your tree is BEAUTIFUL!! I love everything about it! I think the pictures you took are great. Thank you Courtney! I’m loving my tree this year! What a beautiful tree! I haven’t put anything up yet but I want to in a day or two after I finish painting another room or two. 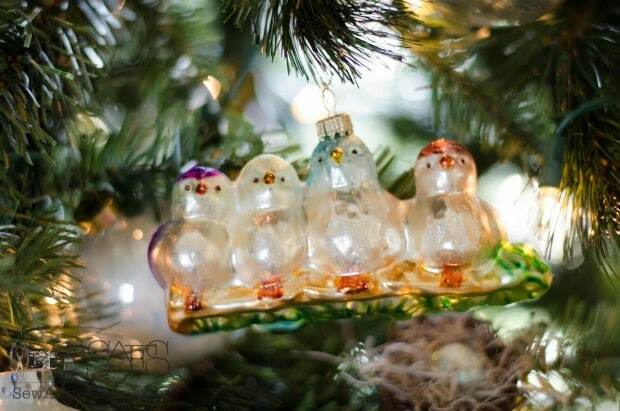 I love Christmas ornaments & have some that are over 50 years old that I either bought or were given to me by my family. 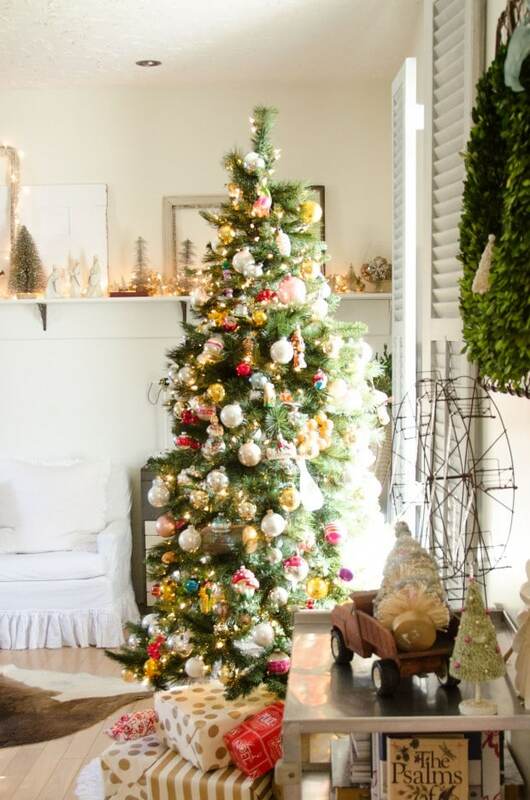 I usually put our 4 foot tree on a box & place it in front of the living room window. When we sized down I had to get rid of the 7 foot tree & get this one. Hopefully, we will be able to put up a larger tree at the next house when we sell this one next year. Jill, I wish I lived nearer to you. I’d love to stop by, have a cup of black coffee & spend some time with you. I really hope to take some time in the next couple months to paint a few rooms in my house. They all need freshened! This post was so beautiful and I felt like I was standing in your living room! 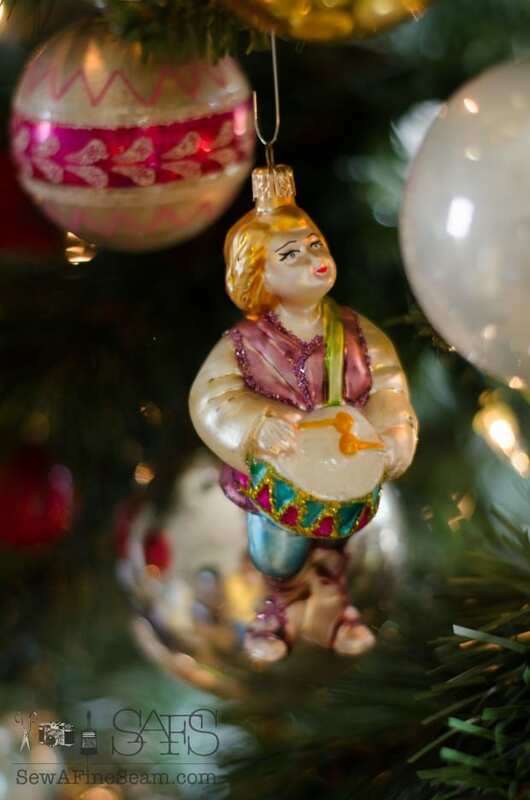 The photos and history of your ornaments will be such a treasure for your girls to know where they came from as gifts and collecting. 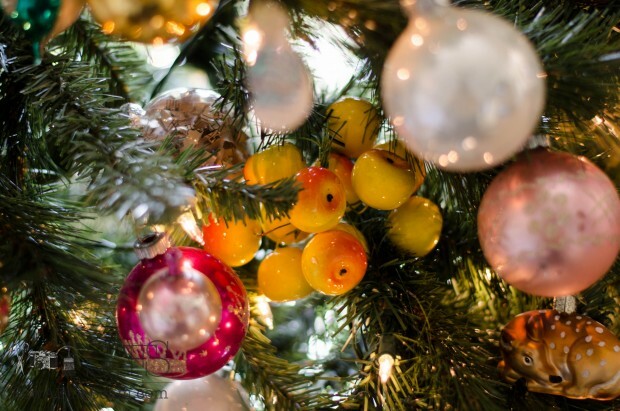 You just made a wonderful addition to your family history of Christmas traditions. We just had five grandchildren and their parents move in with us for a few months this last weekend. 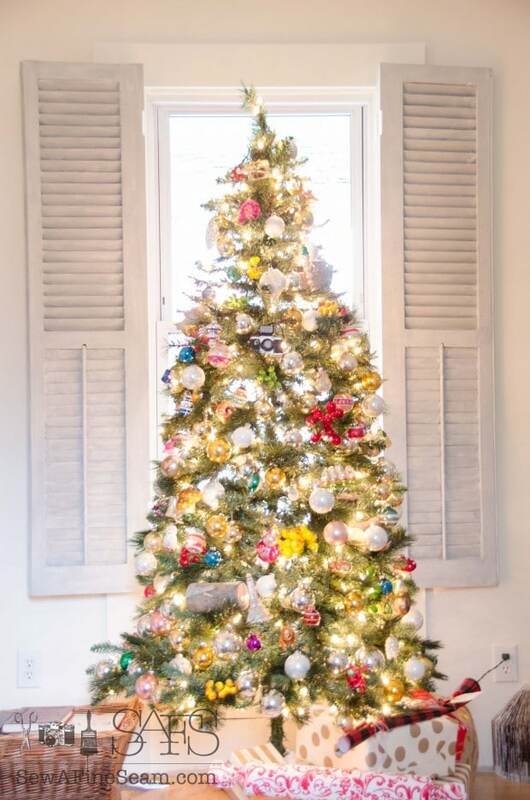 Your post was a nice break from getting settled and I am anxious to have them help make our house all peaceful and beautiful for Christmas like yours! Merry Christmas!! 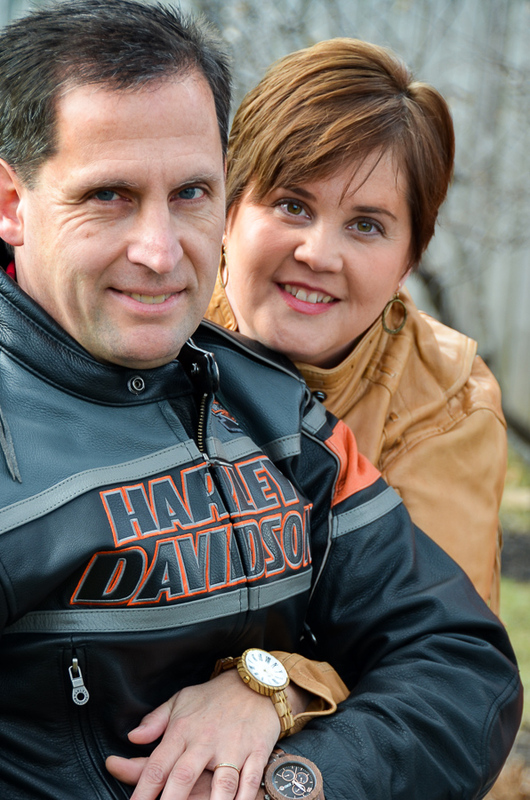 Thank you Carla, and Merry Christmas to you and your family! 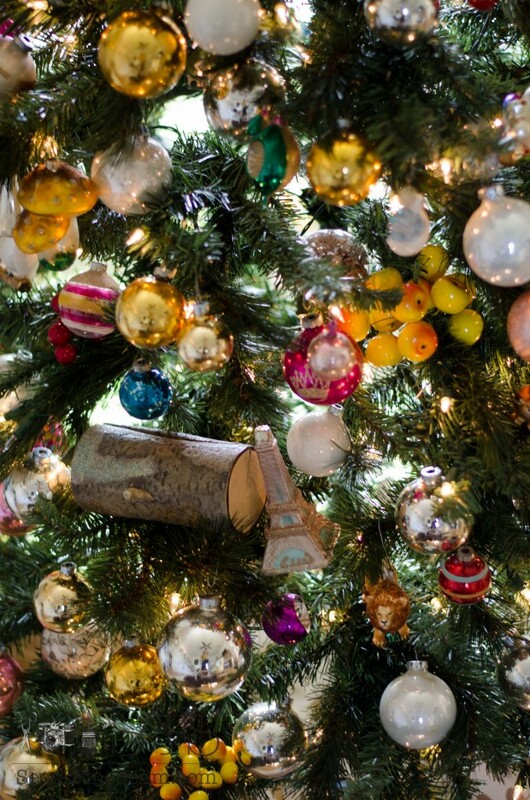 Jill, I love your vintage ornaments and your tree is gorgeous! I love your photos! Thanks Leslie. I am loving sitting in my living room in the evenings. Your tree is beautiful. 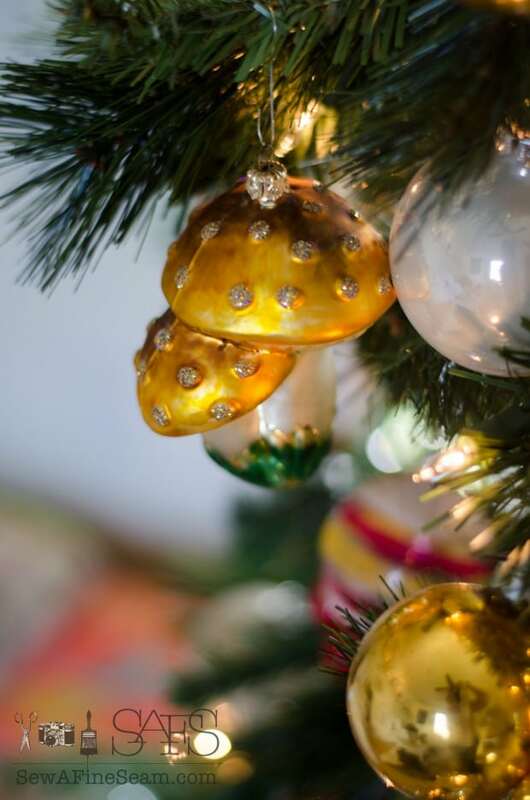 I love all the glass blown ornaments! Thank you Pam, I haven’t added to my ornament collection for awhile and I’m thinking it would be fun to get a few more next year. So pretty Jill and I love the shot that’s out of focus!